A new IMF reports finds that “China has grown rapidly and is on the brink of eradicating poverty. 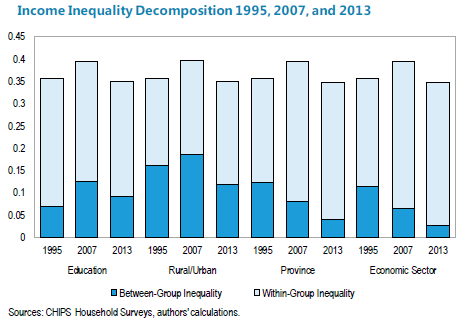 However, income inequality increased sharply from the early 1980s. While less equality is to be expected in the transition from central planning to a market-based economy, China is now among the most unequal countries in the world, despite a recent modest improvement. Inequality has been driven by structural factors (especially demographics, the urban/rural divide and education/skills), with little offset from fiscal policies. These structural factors are likely to drive inequality higher.